Journal — Steelcut Flower Co.
First, I have to mention the other vendors whose work is credited here. Lemon and Lime Event Design were the planners behind this day, sourcing everything from the chandeliers to the linens, and Michael and Carina were the photographers who brilliantly styled the invitation suite above. The bride and groom started with a love of greenery and all things gray, and we built the day around that. The flowers were mostly whites and greens, with a few earl grey roses tucked in here and there to bring out more grey tones. The bride’s bouquet included some blush roses in homage to her late Grandmother, who favored a particular blush rosebush in her garden. Memories are one of the things that make flowers so special. The Evergreen Museum has this stunning fountain and columns, but it often proves a design challenge for our clients. The columns are so high that arrangements up top get missed, and pieces in front of the fountain can look busy. So, we decided to make the fountain look like it was being overtaken by a rose bush, rambling across and around it. 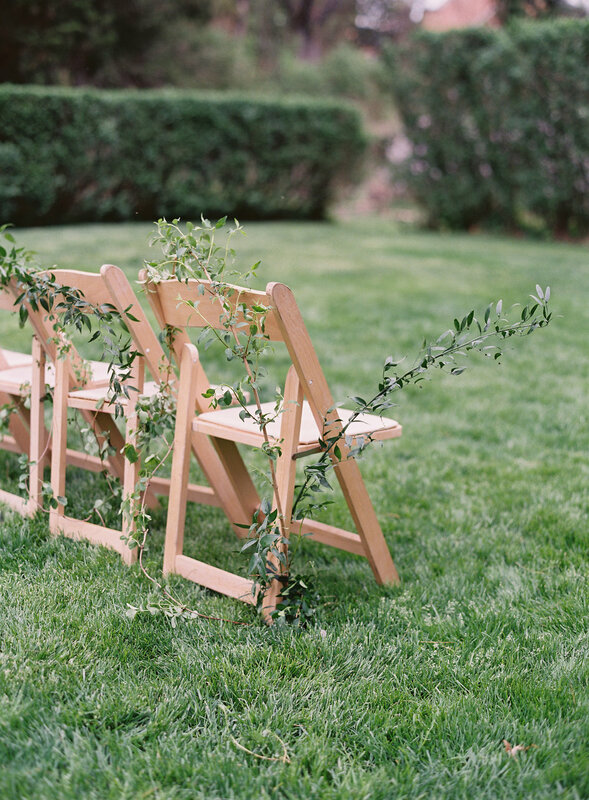 For the ceremony chairs, we wanted greenery but didn’t want anything as formal as a garland, so we tucked in what appeared to be errant, vining greens. And the reception, where we used greenery to dress up these orbs provided by Revolution Event Company. The orbs are normally accompanied by crystal chandeliers, but we wanted the day to have more of a Restoration Hardware vibe, so we nixed the crystal and filled them with greenery instead. For the sweetheart table, the ladies at Lemon & Lime considered incorporating a clock on the wall, as the groom, Adam, is a clock afficianado. We planned to do clocks with wreaths but then decided to nix the clock and stick with the wreaths. I’ve said it before, but I always love circular pieces at weddings because there’s so much symbolism. Here’s to an eternity in this wild garden we call life. 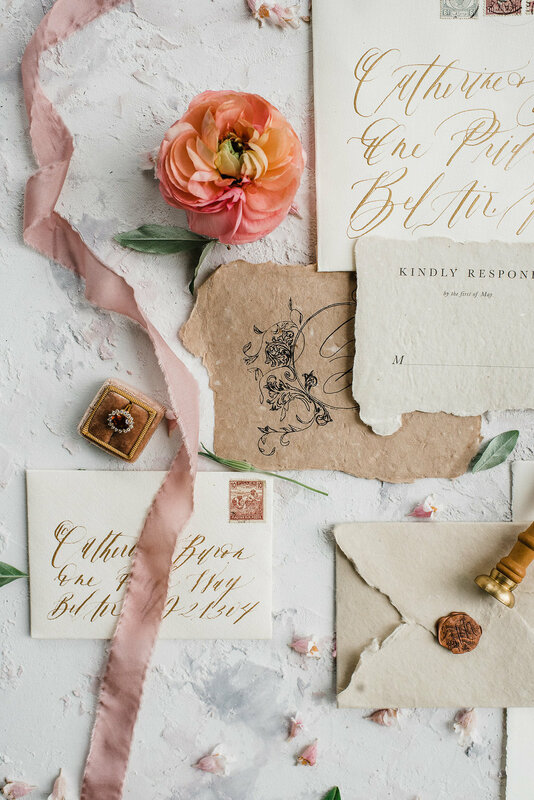 This shoot was dreamt up by Megan Harris Photography and Caitlin Krebs Events. Let me tell you, they have some mad talent. 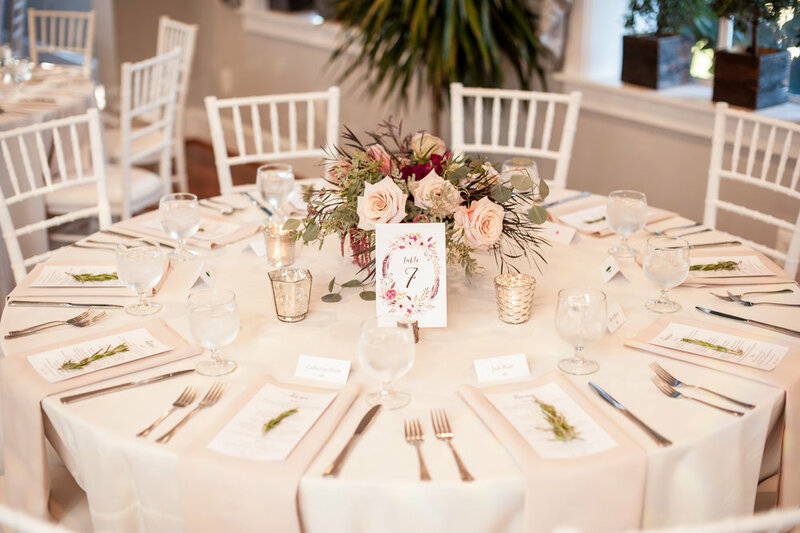 We envisioned a strong yet graceful bridal look with florals and a tablescape that was ultra feminine without being overly sweet. The gown is from Shop Gossamer, don’t you love the champagne undertone? I’ve been drawn to dresses with off-white undertones lately, something about it feels very sophisticated. The Jane Austen quote above has been on my mind lately because my brides are always on my mind. I’ve been trying to communicate that it’s okay to be ‘selfish’ on your wedding day, if it’s the good kind of selfish. I didn’t have the words. Now, seeing the way Austen describes the difference between pride and vanity stated, it’s clear that I was thinking of was selfish pride, not selfish vanity. Of course we take the needs and experiences of guests into consideration for every wedding, and of course we want them to have nothing but good feelings toward the wedding day. At the end of the day, isn’t the wedding about having the guests there to see you stand up boldly with your love? With their presence (and sometimes with their words) they say, we affirm/love/support/believe in you, as individuals and as a couple. What more could anyone need than that? You’ve got the affirmation, now sculpt the day that’s going to delight your senses and reflect you as a couple, without having to think about vanity and fear that outward perception. Anyone who’s there is likely in attendance because they love you and/or your betrothed. Our hope is that every bride we work with can stand at the altar with a heart overflowing with pride- pride that she gets to marry the person who will be her one true love and pride that her life as a single woman is about to be subsumed by her life with another, like a fire growing ever bigger and brighter as she adds more people, more experiences, and more love to her own little spark. I didn’t want to use greenery. Don’t get me wrong, I love greenery, but the trend pendulum is bound to swing the other direction soon, and we’re going to be ready for it. I wanted to avoid any typical “face flowers,” such as roses, spray roses, peonies, dahlias, hydrangea…all of the fluffy goodness that our brides usually ask for…this look is about understated elegance, about teeny tiny unique blooms that have tremendous presence. As the ideas started flowing, we knew we needed a master facilitator to help tie everything together, so we reached out to Courtney and Ariel from Moore & Co., who found our venue, our cake, our models, and so much more. We drew inspiration from the water-washed walls at Ampersea. I'm not sure if there's a more romantic setting for winter weddings than the historic Belvedere Hotel. Kirsten Marie Photography captured it so perfectly. This radiant gem, Katie, is from out of state and she and her now husband wanted an amazing space to show off Baltimore to their friends and family. 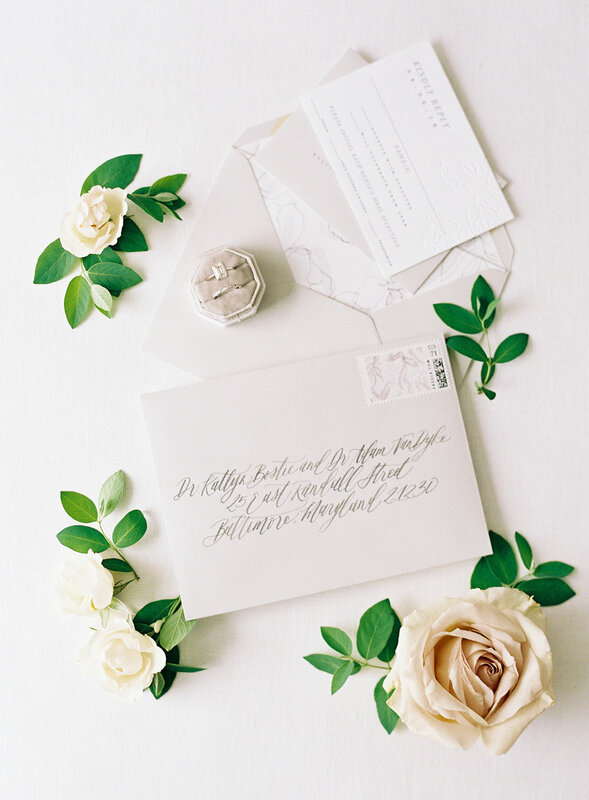 Katie's request when it came to flowers: no boring roses, and lots of greenery and texture. The hand-dyed ribbon from Silk & Willow became her "something blue." And we loaded the bouquets up with one of my favorite winter flowers: anemones. Katie & Jon loved the look of garland down the aisle, but guests needed to access their chairs from the center, so we draped garland down the chairs instead. 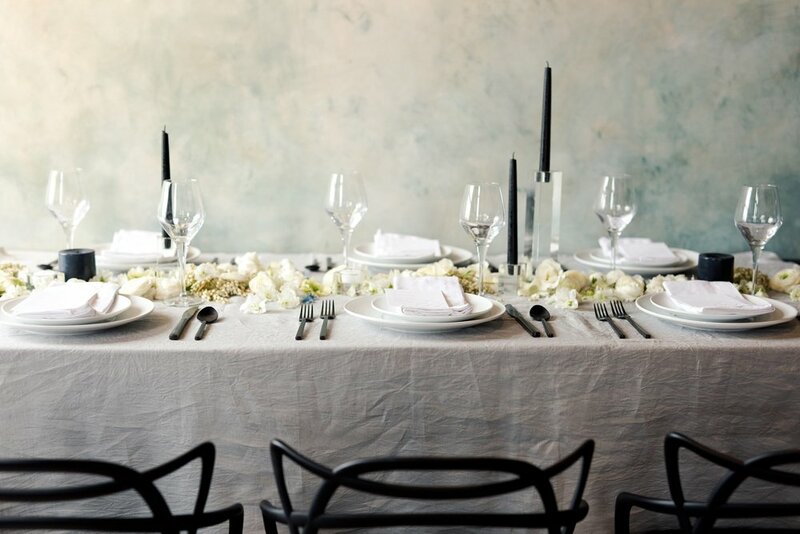 Wintry whites and greens for the low centerpieces. Magnolia "trees" for the tall centerpieces. Just look at these two. "There's bound to be talk tomorrow..."
Wishing you all a flame of joy. When Nichole first reached out to me, she told me they were "non-traditional" and that they wanted to get married in a park. Their first choice fell through, but Canton Waterfront Park became an amazing second. When it came to the flowers, Nichole told me she wanted it to be "weird but still pretty." Her bouquet featured succulents, king protea, garden roses, campanula (from my garden! ), and unripe blueberries from a local farm. The men in her family joined together to create this beautiful wooden arbor that we draped with simple fabric and blooms. Garlands on the back of the aisle are always a yes in my opinion! This photo from Barbara O. photography made me cry happy tears. Usually I'm a few steps ahead of the bride on the wedding day, and when I see the pictures I get to see everything come together. The ceremony site and the venue are never fully alive until the bride and groom enter. Wishing you all a walk by the water this week. These images are from a mini-shoot last winter in collaboration with Peyton Weikert photography. Peyton gave me free reign, so I chose to experiment with hues of mustard, berry, blush, and crimson. I found that white berry growing outside a Sheetz gas station- thankfully, a pair of clippers resides in the glove box of my van. I always try to include at least one foraged item in every bridal bouquet that leaves the studio. I believe those foraged pieces ground the bouquet in time and place and ensure that no one else in the world will carry the same bouquet. Wishing you all a few hours to "drift" this week. When I first encountered this quote, I couldn't decide whether to categorize it as creepy or romantic. But the more I looked at it, the more it stuck. What could serve as a better example of steadfastness than the ocean? I wish I could channel some of the consistency of the tide into my own marriage- to overlook minor grievances, to take out the trash when I've had a long day of work, or to say I'm sorry without any strings attached. Seven years ago, I could never have predicted what my relationship with Matt would look like today. Sometimes when I'm very frustrated, I pull out our wedding album so that I can re-live the feeling of being young in love, and remember what a gift it is to be joined with one person forever- a person who knows you as thoroughly as one can be known. I love that I get to experience the high tides of excitement and optimism that define the wedding planning process. I also love knowing that as the couple's relationship ebbs and flows, this moment will be forever lodged as a good one that they can look back on. And I love that flowers are able to transport them back to that time. See the rosemary on the place setting above? My guess is that whenever Neha & Scott smell rosemary, they remember the way their fingers felt a little sticky after moving the rosemary from their napkin, the way they looked at each other as husband and wife, and the way their hearts overflowed. Neha texted me the day after their wedding and said, "I am SO glad I chose you as my florist- everything was just as I imagined, but better." My hope is that every Steelcut couple has this experience. Wishing you all the strength of the ocean. 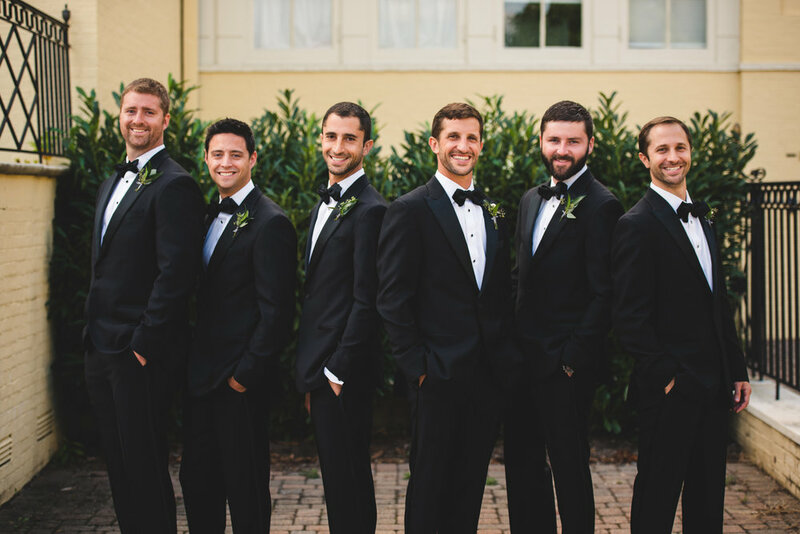 Spoiler alert: This wedding contained minimal florals. Nicole's bouquet feautred garden roses, ranunculus, eucalyptus, pokeberry, clematis vine, and a few teeny tiny succulents. I love the simplicity of the materials and the rich texture. Fun fact: The venue above used to be a girl's school, and is allegedly haunted. Another one of my couples who got married there last year dedicated their signature cocktail to the youngest spirit. Wishing you all an uncomfortably long gaze into the eyes of your partner. "My love is a hundred pitchers of honey." As I flip through these images by Michael Stavrinos Photography, I'm low on words and high on emotion. I'll let one of my favorite poems take it from here: The Forgotton Dialect of the Heart, by Jack Gilbert. God, we say, Rome and Michiko, we write, and the words get it all wrong. We say bread and it means according to which nation. French has no word for home, and we have no word for strict pleasure. My love is a hundred pitchers of honey. Shiploads of thuya are what my body wants to say to your body. Giraffes are this desire in the dark. no name but amber, archers, cinnamon, horses, and birds." What a privilege it is to partner with couples on a day where feelings are so deep and so wide that even the best-worded wedding vows fall short. Thanks to Michael Stavrinos Photography for making it hard to narrow down a few images to share. May each of you dip into your personal honey pot this week. Holy moly, me oh my, those blue ridge mountains and clear skies. Daniel Min Photography captured this late summer wedding perfectly, and all photos in this post are attributed to him. There's a reason they say Virginia is for lovers. Brittany, the bride, requested interesting textural elements with a subtle fall palette. A.J. had a "groomswoman", which I loved. It's 2016, so make your own rules about who should stand where. Wine barrels greeted guests coming and going. Fathers and daughters. Enough said. Some of my favorite floral pictures are the less obvious ones, of flowers doing what they do when they think no one is watching. Those ribbons in the sunlight? You can't plan that. Never could be sweeter than with you." I hope you feel like a champion. The Rawlings Conservatory is located in Druid Hill Park and if you haven't been there, you must go. Giant cacti, palms for days, and my personal favorite: the orchid room. This summer, the conservatory turned 125, making it the second oldest glass conservatory in the nation. Walking among plants older than anyone I know puts life in perspective. Our time is so short. Flowers and humans aren't really so different- exerting great energy toward an existence that's arguably pointless, yet capable of so much beauty. 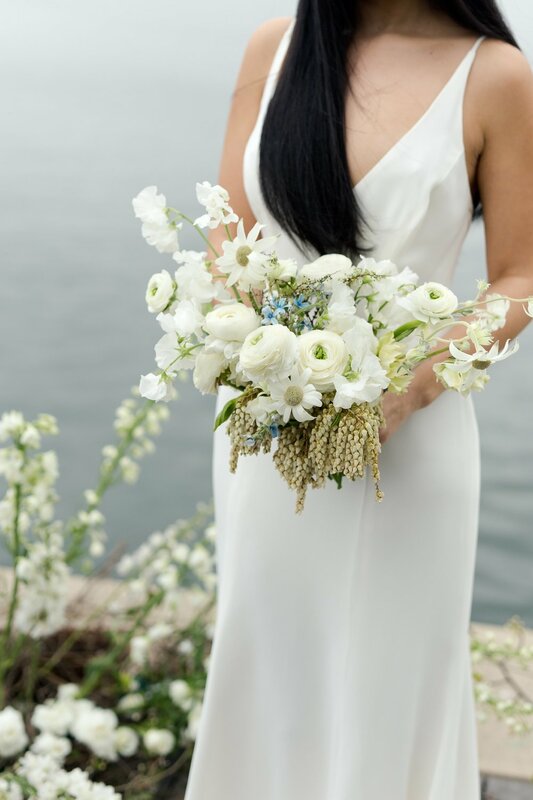 This bouquet was a compilation of blooms you can find inside the Conservatory (palm, cymbidium orchid, anthurium, jasmine), and blooms you can find in Baltimore (spirea, daffodils, ivy). I try to include at least one foraged element in every bouquet that leaves the studio. I find it grounding. Wishing you all a lovely indulgence. In June I partnered with Maketribe and the Baltimore Museum of Art for the final installment of their workshop series to showcase their "Re-imagining Home" exhibit . We spotlighted edible flowers sourced from organic, local farms. There is nothing like being hella pregnant and trying to maintain composure for an outdoor flower demonstration. It smelled like rosemary and sweat. Greenstone Fields provided the amazing poppies shown above, as well as the white campanula in the picture below. Most of the other items came from Laura Beth of Butterbee Farm, who offered growing and usage tips for some of the edibles on her farm. Scroll down to the bottom to see a list of a few of the blooms we sampled. The fluffy pink stock shown above is actually in the cabbage family, can you believe it? It smells like sunset and cupcakes. I like to build a foundation of greenery before adding any focal flowers. Always strip any foliage that will be below the water level in your arrangement in order to prevent bacteria growth in the water and change your water frequently. Idle flower water smells like cat pee and regret. Student work featured below. I love their gumption. I'm always amazed that the same materials can look so different in different hands. Special thanks to Jess at Maketribe for planning yet another lovely workshop, the Baltimore Museum of Art for hosting us, and Horace & Mae photography for the beautiful photos. Wishing you all a surprising encounter that feels like 'home' this week. "like the water of a deep stream, love is always too much...we enter, willing to die, into the commonwealth of its joy." How do you view flowers? What's your relationship to them? A delightful graduate student interviewed me recently and asked what my favorite flower was. I replied that there is no favorite- that's like asking me to choose one "best friend" for my whole life. I mean, my best friend at age 5 was a girl I met at the skate rink named Beverly, which I pronounced "Bubberly." My point is, while some friends stick around longer than others, we normally move through seasonal friends as well. The pictures in this blog post are taken by a new friend: Julie Andersen. She reached out to me via Instagram to photograph my flower arranging process, and I'm so glad I said yes. Turns out, we chatted about everything from our love of Scandinavian decor to how to be simultaneously generous and protective of our creativity. On the surface: Stranger Danger! In person: total kindred spirits. Plus, she's a wildly talented photographer and teaches FREE yoga classes in Baltimore! Click here to find her. My current interests, which have dictated who I'm spending my time with, include renovation projects, motherhood, being a #girlboss, seltzer water and lipstick, and clean yet indulgent eating. 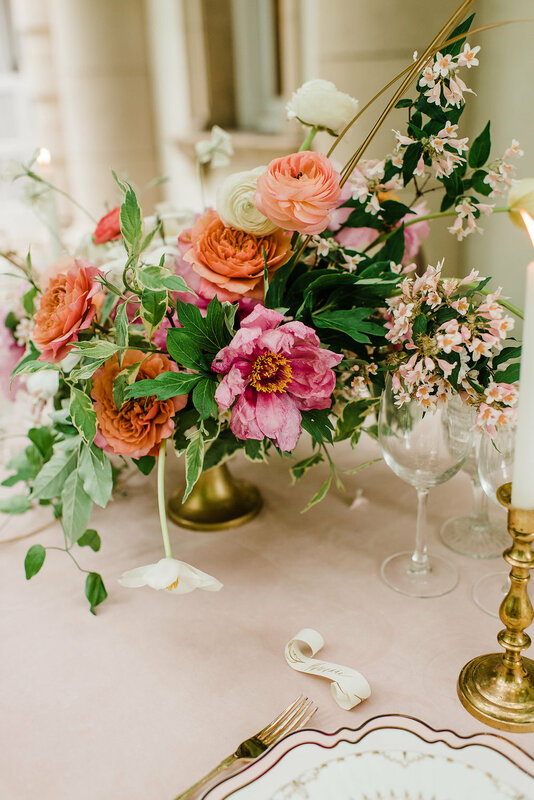 The florals in this post were for Cake 'n Whiskey, a nationwide women in business networking event, also known as the perfect opportunity to get creative and use some non-bridal blooms: palm leaves, terra cotta anthuriums, and copper cymbidium orchids. My take-away: don't limit yourself to only the flowers you know, because that will limit what you know about yourself. Here's to hoping you stumble upon a new bloom this week. I don't sit around and read Camus. Most of my encounters involve being hit over the head with one of his quotes when I'm reading something a little more...tangible. This is a case where I'm taking a quote entirely out of context and using it to talk about flowers. Winter arrangements are some of my favorites, because they so perfectly depict tension. Tension between fall and spring, light and darkness, life and death, grit and grace, whatever your pairing of choice is. No other season permits "dead" foliage, barren branches, and negative space. Spring, summer, and fall usually involve easily accessible farmer's market bouquets, zinnias and roses in gardens, and petunias on restaurant patios. Flowers can seem commonplace. But blooms in winter are a delicacy, a nod to that "invincible summer" that is apparent in the buds plumping on every bare branch, and to the lingering evergreens still decking some halls in mid-January to remind us that all of the presents might be unwrapped but hope, expectancy, warmth, generosity-- everything encompassed by a trite phrase like "holiday spirit"--never dies. Kind of like the wedding industry. We're an industry of dreamers. It might be snowy outside, but we're already thinking of spring and fall, imagining how we will use our medium to tell our clients' stories and capture their own "invincible summers." Take this December photo shoot, for example. You would never guess that it was created with freezing temps outside just a week before Christmas. It was a last-minute shoot yet the professionals involved conjured up a healthy dose of serenity, warmth, and beauty. Wishing you all an encounter with your own invincible summer this week. This was our first year growing marigolds. We wouldn't have purchased them, but farmer Ben from Irvington Spring Farm gave us leftover seed, so we figured, why not? They're the farm version of carnations- scorned by most for their commonality but loved by a few for their hardiness and cheer. I must say, their vase life was impressive. I put some in a vase on our patio for a birthday party, and they still looked good 20 days later when I finally got around to disposing of them. Need I say more? Yes, because unfortunately computer screens aren't scratch 'n sniff, yet. They smell like a musky, tangy, Christmas in July, minus the body odor. I found myself chopping the blooms off and using just buds and greens for a more subtle design element. Did you know marigold flowers are used for organic dyes? Hurricane Joaquin left us with two decapitated beds in September, and we were able to pass the heads on to Claire and Ashton at Wax & Wane fiber company. I think they used them to dye scarves. Finally, marigolds are safe. I don't have to worry when Lola gives them a smell and a lick. Wishing you all an encounter with a tangy, musky, seasonal scent. I've had the opportunity to work with a lot of talented people over the years. As an employee, I've gotten positive feedback about my "critical eye" and my "strong opinions." While I think it's important to remain critical, it's much easier to criticize than it is to create. It's easier to discern than to develop. Easier to jump ship than to commit. 1. I have an appetite for flowers I can't shake. 2. I respect people who balance children with work, and I want Lola Rose in my life on the reg. I used to think keeping children out of day care was "best for the child," but now that I'm a Mom, I realize it has very little to do with Lola, and very much to do with me. Being a Mom makes me kinder, more patient, and more vulnerable. I think it would do me good to bring that into my business. 3. I'm a watcher. Of people, of nature, of trends. A job that encourages me to pay attention to the world is a job I want.